He took it upon himself to get back into the best shape of his life--and along the way has become THE go-to guy for training other pro athletes as well as regular people just looking for a great workout at his Dallas gym Driven Elite Fitness and Health Center. With his trademark motivational energy and charisma, he now shares his 3D's: the determination to eat for weight loss; the discipline to achieve high-intensity, muscle-building workouts; and the drive to push yourself to your best. Whatever your starting level, this workout blueprint will guide you to peak performance, with targeted nutritional and motivational advice for each of its 3 levels. 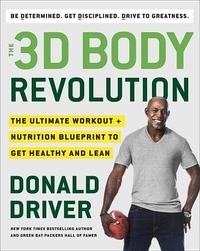 Filled with insights and insider stories from his life on and off the field, Driver also offers a clean eating plan with 25 recipes targeted to caloric needs as well as 50 photos of him demonstrating the exercises. This is your path to peak performance and phenomenal fitness.